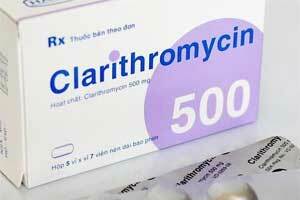 Clarithromycin is typically used to treat multiple types of infections of the skin, ear, sinus, lung, and other parts of the body. It is also used for treating Mycobacterium avium complex (MAC) infection, a type of lung infection that often affects people with human immunodeficiency virus (HIV). FDA has issued a warning that Clarithromycin may increase the risk of cardiovascular problems or death years later, following a review of a 10-year follow-up trial of patients with coronary heart disease who were treated with the antibiotic. Therefore according to FDA caution must be exercised before prescribing clarithromycin to patients with heart disease. In CLARICOR, a large clinical trial-it was observed that there was an unexpected increase in deaths among patients with coronary heart disease who received a two-week course of clarithromycin that became apparent after patients had been followed for one year or longer. There is no clear explanation for how clarithromycin would lead to more deaths than placebo. Some observational studies also found an increase in deaths or other serious heart-related problems, while others did not. All the studies had limitations in how they were designed. Of the six observational studies published to date in patients with or without coronary artery disease, two found evidence of long-term risks from clarithromycin, and four did not. Overall, results from the prospective, placebo-controlled CLARICOR trial provide the strongest evidence of the increase in risk compared to the observational study results. Based on these studies, FDA is unable to determine why the risk of death is greater for patients with heart disease. As a result, FDA added a new warning about this increased risk of death in patients with heart disease, and advised prescribers to consider using other antibiotics in such patients. FDA also added the study results to the clarithromycin drug labels. As part of FDA’s usual ongoing safety monitoring of drugs, we are continuing to monitor safety reports in patients taking clarithromycin. FDA is advising prescribers to use other antibiotics in all patients, especially those with coronary heart disease.The prescribers should also educate patients with heart disease of the signs and symptoms of cardiovascular problems, regardless of the reason for using clarithromycin, according to the release.